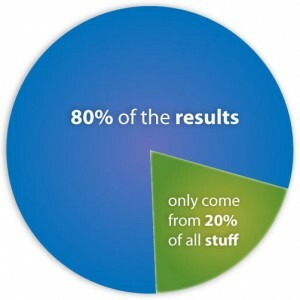 The majority of you are probably familiar with the Pareto principle. It suggests that roughly 80% of the effects come from 20% of the causes. The principle makes perfect sense especially in branding as 80% of marketing profit probably comes from 20% of the total customers. Focusing your marketing effort on building the relationship with this 20% segment might just be adequate and efficient. 1. Utilize email marketing: Google’s most recent new product is the email extension (see image) which allows brand to collect searchers’ email addresses under their consents. If your company has yet done email marketing in the past, this would be a good chance to start. Cultivating the contact list and maintaining the relationship will help bringing in additional return consumers for your products or services. 2. Give exclusive discounts and perks: Under the allowed profit margin, give out discounts and rebate offers frequently for loyal customers with an emphasis on exclusivity. People enjoy exclusive deals. Rewarding your loyal customers will not only assure their return for additional purchases, but also open up more referral opportunities. Loyal fans are the best brand advocates. 3. Reach your customers through social media: Understand your audience through as many channels as time and resource allows. Start the conversation and track your effort. 4. Encourage membership sign-up: Online membership has become so common that online customers seem to no longer mind signing up and filling out forms as long as the form is within one web page, no scrolling. Take advantages of this mentality and build a membership list after sales already being made. 5. Remind your visitors: If a member has yet had an activity for sometimes, a reminder is a great practice in order to warm up the old leads. In the digital world, it is surprisingly easy to lose touch and we definitely do not want to lose touch with our 20% loyal customers. If you have any other tips in building the relationship with your loyal customers, please share with us! p/s: You might find my posts at Mixed Digital blog. I have worked with them in the past and know they are a team of excellent digital marketers, especially in the lifestyle and entertainment vertical. I highly suggest following them for future updates!